1885-1914. Mary Fields, a fifty-three-year old second-generation slave, emancipated and residing in Toledo, receives news of her friend's impending death. Remedies packed in her satchel, Mary rushes to board the Northern Pacific. Days later, she arrives in the Montana wilderness to find Mother Mary Amadeus lying on frozen earth in a broken-down cabin. Certain that the cloister of frostbit Ursuline nuns and their students, Indian girls rescued from nearby reservations, will not survive without assistance, Mary decides to stay. She builds a hennery, makes repairs to living quarters, cares for stock, and treks into the mountains to provide food. Brushes with death do not deter her. Mary drives a horse and wagon through perilous terrain and sub zero blizzards to improve the lives of missionaries, homesteaders and Indians and, in the process, her own. After weathering wolf attacks, wagon crashes and treacherous conspiracies by scoundrels, local politicians and the state's first Catholic bishop, Mary Fields creates another daring plan. An avid patriot, she is determined to register for the vote. The price is high. Will she manifest her personal vision of independence? 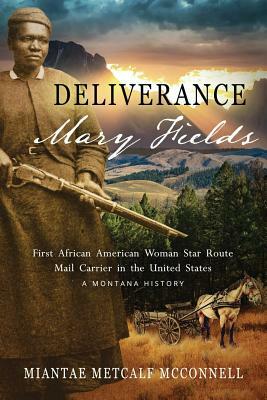 MIANTAE METCALF MCCONNELL'S RESEARCH enabled USPS historians to verify Mary Fields as the first African American woman star route mail carrier in the U.S. A fact-based chronicle of Fields' life in Montana from 1885 until her death in 1914, the narrative examines women rights, bootleg politics, Montana's turn-of-the-century transition from territory to state and its scandalous woman suffrage election. For those interested in United States and American west History, this book portrays the nation's multiethnic struggle for human rights by presenting factual discoveries and personal life stories. Miantae Metcalf McConnell, award-winning author and descendant of Montana homesteaders, lives near the Rocky Mountains in Big Sky Country.